I already wrote an article describing the OSI model and its 3 first layers (physical, data link and network). Now I’ll talk about the layer 4: transport. 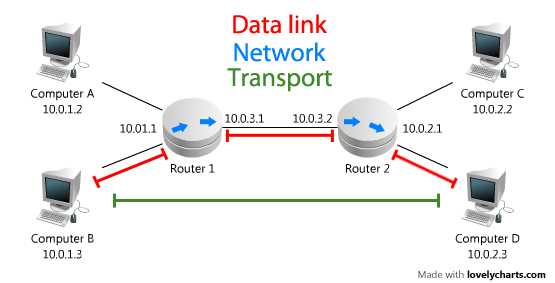 While the data link layer carries the point-to-point connections and the network layer carries the routing of packets, the transport provides end-to-end communication services for applications. The transport layer provides convenient services such as connection-oriented data stream support, reliability, flow control, and multiplexing. The two main transport protocols are TCP and UDP. A connection between two devices on the transport layer (with TCP or UDP) is done from port to port: Each network device using the protocol TCP or UDP has different “gates” where a communication can “go in or out”. For instance, the default port to access a web server to communicate with the protocol HTTP is the port number 80, the protocol FTP uses the port number 21 and the protocol SSH uses the port number 22. (N.B. HTTP, FTP and SSH are protocol from the application layer). Applications that communicate on IP networks are bound to one (or more) port(s) to send and receive data. There are 2^16 different ports available (since the field for the port in the packet is 16 bits). The Internet Assigned Numbers Authority has divided port numbers into three ranges. 0 – 1023 are used for common, well-known services. 1024 – 49151 are the registered ports used for IANA-registered services. 49152 – 65535 are dynamic ports that are not officially designated for any specific service, and can be used for any purpose. In effect, they are used as temporary ports primarily by clients when communicating with servers. TCP is a connection-oriented protocol. This means it first establishes an end-to-end communication session before any data may be send. TCP is a protocol that makes sure the data has been well delivered, in the correct order. To do so, the TCP emebed in its header a checksum verifying the data is not corrupted. There is also a sequence number to assemble the packets in the original order. 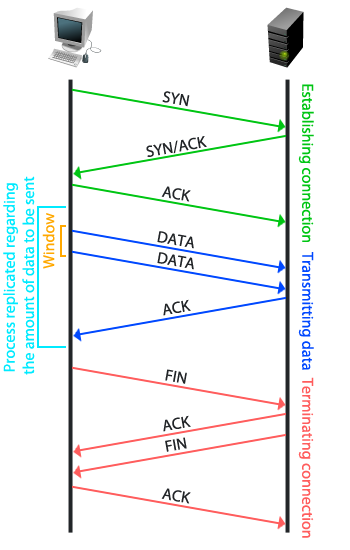 Packets may use different paths to reach the recipient, or a corrupted packet need to be resend. This means the recipient might get the packet in the wrong order, the sequence number make sure when reassembling, packets are in the correct order. One other interesting feature of TCP is the windows handling. The rate of data transmission between two devices is managed by a windowing system to prevent a fast sender from transmitting more data than can be supported by the receiving. Source port: It is the port used by client to sent the packet. Sequence number: If the SYN flag is set, it is the initial sequence number. If it isn’t, then it is the accumulated sequence number of the first data byte of this packet for the current session. Acknoledgment number: If the ACK flag is set, then it is the value of the next sequence number that the receiver is expecting. Data offset: It specifies the size of the TCP header in 32-bit words. Reserved: This field is reserved for a future for a potential improvement of the protocol TCP (should be set to zero). Flags (NS/CWR/ECE/URG/ACK/PSH/RST/SYN/FIN): Also known as control bit, flags are notifications and gives signal the purpose of the packet. URG indicates that the Urgent pointer field is significant. ACK indicates that the Acknowledgment field is significant. All packets after the initial SYN packet sent by the client should have this flag set. RST reset the connection. SYN synchronize sequence numbers and FIN indicates no more data will be sent from sender. Windows Size: It specifies the number of bytes that the receiver is currently willing to receive. Checksum: The 16-bit checksum field is used for error-checking of the header and data. Options: The length of this field is determined by the data offset field. This field is used for providing more information about the packet. Padding: The TCP header padding is used to ensure that the TCP header ends and data begins on a 32 bit boundary. The padding is composed of zeros. SYN: The client initiate the establishing of the communication by sending SYN to the server. It sets the segment’s sequence number to a random value A.
SYN-ACK: In response, the server replies with a SYN-ACK. The acknowledgment number is set to one more than the received sequence number (A + 1), and the sequence number is set to another random number, B.
ACK: Finally, the client sends an ACK back to the server. The sequence number is set to the received acknowledgement value (i.e. A + 1), and the acknowledgement number is set to one more than the received sequence number i.e. B + 1. FIN: One of the endpoint (host A) sends a FIN then wait for a ACK and a FIN from the other party (host B). ACK: The host B replies with an ACK. FIN: Then host B send a FIN. ACK: Finally host A ends the communication with a last ACK. UDP has been design for computer applications to send messages (referred to as datagrams) to other devices without requiring prior communications to set up special transmission channels or data paths. Unlike TCP, UDP uses a simple transmission model without establishing a session with the recipient. UDP doesn’t ensure reliability, ordering, or data integrit in order to provide a faster communication. Thus UDP is used for time-sensitive applications (such as real-time systems) that don’t require 100% reliable trasmission. UDP is a message-based connectionless protocol. It means UDP doesn’t establish a dedicated end-to-end connection but it transmitting directly information in one direction from source to destination without verifying the readiness or state of the receiver. Destination port: It is the port used by the server for the communication. Lenght: It is the length of the UDP header and data. Checksum: It is optional. The checksum field is used for error-checking of the header and data. If a checksum is not used it should be set to the value zero. Now, in order to illustrate how does TCP and UDP communicate and how packets are structured, here is a demonstration with Scapy. random() is a python module that generates pseudo-random numbers. randrage() set the range of the pseudo-random number. Type sudo python the-name-of-the-file.py to run the script. You will notice that the script actually doesn’t work. I’m not sure about it (and please leave a message if I’m wrong), but it seems Scapy uses an other TCP stack than the kernel. This means whenever Scapy sends the SYN packet, the kernel is not aware of it, so when the server answer with a SYN/ACK, the kernel also get the packet and doesn’t understand why the server sent a SYN/ACK. Therefore, it send a RST TCP packet to reset the connection. In order to avoid this problem, I created a rule in my firewall (on my VM Ubuntu 10.10) to drop all RST packets going out. eth0 being the interface used for sending the packet with scapy, 192.168.0.7 being the IP of the my VM that send the packet. Now if you try script, you will see the TCP connection is established and that HTTP GET request (nearly) works. The server is waiting for an ACK once the window reached, since it doesn’t get any ACK, it keeps resend the packets. Well the main goal was to describe what is the layer transport and how does the two main protocols of this layer (i.e. TCP and UDP) work. The script is not finish yet, but you got an idea how scapy works and how to establish a TCP connection. I think I will create another post to improve the script an also use pfctl to avoid the RST problem on OS X. Do you have an update on whether scapy uses the system’s tcp stack? A rsponse would be very helpfull. The kernel is not aware of what Scapy is doing behind his back. If Scapy sends a SYN, the target replies with a SYN-ACK and your kernel sees it, it will reply with a RST. To prevent this, use local firewall rules (e.g. NetFilter for Linux). Scapy does not mind about local firewalls. Very nice article, thanks. (Small fix: In the end of 3rd paragraph I think you meant “since the field for the port in the packet is 16 bits”, not 16 bytes). Thank you _JF for the comment. Indeed I meant “16 bits”. It’s not the first time I make this mistake. I just correct the text, thanks for the feedback. For the first time I finally understand this layer. I am facing one more problem. My Scapy is sending SYN packet. Target is responding with SYN/ACk Packet. I could see SYN/ACK packet in tcpdump but its not receiving at scapy code. Please let me know why ?